Winning a Kindle Fire is now a monthly event at youZingit. 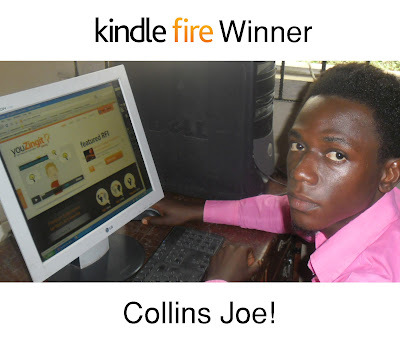 Congratulations to Collins Joe for being the first to win the monthly referral contest on the youZingit website. Entering to win is super easy. Just go to the Referral Program section of the website (part of the "About" section) and select the "Kindle Fire" button. All you need to do then is select the social network where you would like to share youZingit. At the end of the contest, the person with the most friends that registered for free on youZingit wins! You can also use the custom link to email directly to your friends so they can register and get paid for ideas on youzingit. In addition to the referral contest, there are two other referral programs available. One is a free download of the youZingit "Idea Guide". This is a comprehensive step by step guide on how to post your ideas on youZingit, while making them more appealing marketable to companies. Just click on "Idea Guide", share the link on your social network of choice and you get the free instant download. Next is the "Two Months Premium for Free". This allows you to get two additional months of premium for free with the purchase of an annual Premium subscription for only $39. All you need to do is get 5 friends to register for free. We hope you will participate in the youZingit Referral Programs. It only takes a few seconds and you have nothing to lose! Click below to go directly to our Referral Program section of our website. Get Paid for Ideas! youZingit is Here! The wait is over! youZingit has launched its beta website and is presently sponsoring four "Requests for Ideas" contests to compensate its beta users for participating. It is time to get paid for ideas as you submit your ideas to win a total of $6,000 in compensation. youZingit will allow you to post your own ideas about anything or you can respond to one of the Request for Ideas. After the beta period, youZingit will be hosting "Requests for Ideas" by Companies and Brands for thousands of dollars in cash awards. When you post an idea on youZingit, it is always posted in a "short form" and only after a company pays a "view fee" can they see your full idea with any photo, graphic or video attachments. View fees typically cost $20 each and companies will have set view fee budgets to pay for many of the ideas submitted. Once they pay for a view fee, they have the option to purchase the rights to the idea with a larger cash award. Only premium members can collect the view fees, but free members can still collect the larger cash awards and get paid for ideas. 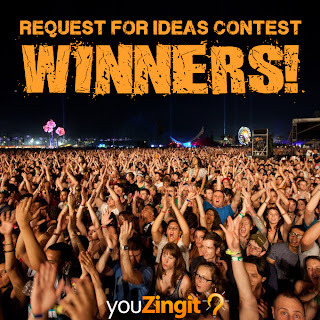 Click on the link below to see our current "RFIs" or "Requests for Ideas"
It is another successful contest on youZingit where our users or "Creative Consumers" get paid for ideas. 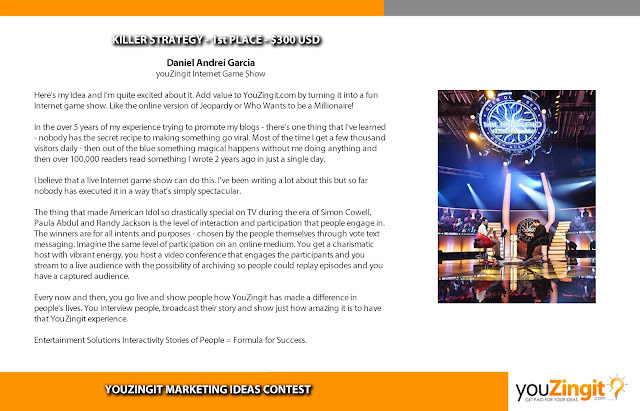 This time the challenge was for our fans to develop ideas to help spread the word about youZingit in the form of marketing concepts to help youZingit grow its userbase. This contest is the latest in a series of contests hosted on Facebook to "prepare" our users for the unveiling of our new website where companies will host contests or a Request for Ideas (RFI). These RFIs will present challenges to youZingit users to solve business problems to improve products and services, create names or slogans for new products, packaging ideas and a host of other tasks. The winners will be awarded cash prizes and gain recognition for their efforts. This is a mutually beneficial interaction between Consumers and Brands. Brands will receive great ideas directly from their consumer base, identify trends in the market and get brand recognition resulting from sharing on social networks. youZingit is committed to adding value for both Consumers and Brands. In our latest contest, the first place $300 winner was Danny Garcia, an avid blogger, freelancer and online enthusiast. His winning entry, shown below, was to create a live online game show to engage our audience on a new level. The game show would be interactive, with the audience voting for contestants. We have some great ideas about the content of the show and are excited to experiment with it. Check out the youZingit Facebook page to see the other creative ideas submitted in the contest. youZingit is a place where people get paid for ideas and get recognized for their creative work. Look for the unveiling of the youZingit Beta site in the next few days. Sign up for an invite at http://www.youzingit.com/. There will be opportunities for our beta users to earn lots of cash awards and get discount on our value added premium subscription.